Chloride is the anionic form of chlorine. It is the most common of the anions found in living organisms. Chloride ions play a variety of important physiological roles. Chloride channels are found in a variety of cells and are responsible for setting resting cell membrane potential and regulating cell volume. In the nervous system, the action of glycine and GABA are related to chloride levels in specific neurons. Chloride is also instrumental in maintaining the acid-base balance in blood. The kidneys are instrumental in closely regulating serum chloride levels. There are a number of pathologies associated with defective chloride transport; the most well-known being Cystic Fibrosis, caused by a mutation in CFTR a membrane chloride transporter. The Chloride Assay Kit provides a quick, simple method for quantification of Chloride in a variety of biological samples. Blood and urine can be used directly after dilution with water. The assay is based upon the competition of Hg2+ and Fe2+ for TPTZ. The preferred Hg-TPTZ adduct exhibits no color. In the presence of Chloride, Hg2+ forms HgCL2 freeing up TPTZ which then binds the available Fe2+ giving a very intense absorbance with a ?max~ 620nm. 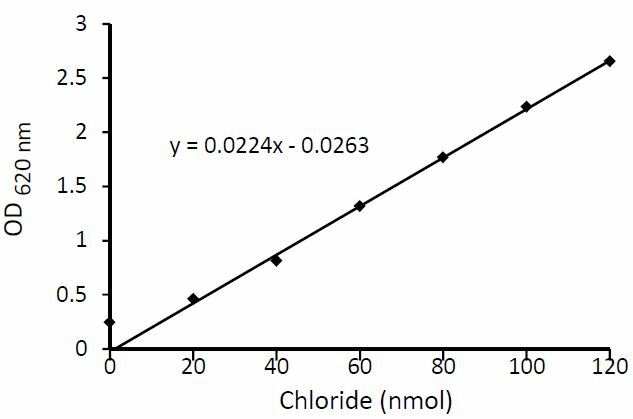 The assay is linear in the range 20 to 120 nmol Chloride/well with detection sensitivity ~0.4 mM chloride. 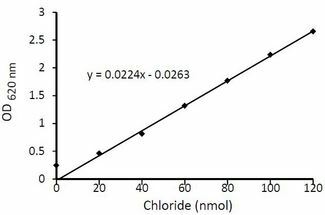 The assay is linear in the range 20 to 120 nmol Chloride/well with detection sensitivity ~0.4 mM chloride. Shipped Ambient, Store at Store at room temperature for up to 1 year., 12 months shelf life.